Citrus Party Kanu is being released on draft in select locations, and 4pk/16oz. cans. Click here for more information on where to buy this beer. Citrus Party Kanu pours thick with a heavy, foamy, head into the glass. As the head dissipates, the beer comes out to be a hazy rusty orange in color. At first glance there looks to be plenty of carbonation. As I started drinking, these carbonation bubbles faded quickly away. The aroma from the beer is very citrusy, and heavy on the grapefruit. I get a hint of a musky melon in there too, but it is only lingering. Taste wise this beer has a medium to light mouth feel, and the carbonation is very soft and gentle. Flavor wise is right on the nose, it is a citrus party. Grapefruit and lime are the first, and most abundant flavors I taste. There is some persistent tangerine flavors hanging out as I drink on. It finishes with a deep-rooted earthy hop’s bitterness. For pairing my picks would be to pair this with pork that doesn’t have a heavy, or a light sauce/rub applied to it. Think of a Christmas ham glazed in pineapple. Also some stronger non-salmon fish would go well with this beer. Shrimp and scallops are also some wonderful pairing partners for Citrus Party Kanu. Overall this was a really fun beer to drink. 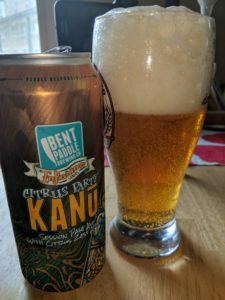 If you are looking for a session beer that is not overwhelming or in your face, Citrus Party Kanu might be what you are looking for. It is well crafted, and delivers exactly where it says it will deliver. It is also a very easy beer to introduce non-craft beer drinkers too. It’s not too crazy, but showcases what a little imagination and ingenuity can bring to the world of beer. I am giving this beer the Beerploma Seal of Approval!